I first head Adele sing some years ago on SNL. I am old now and am not often up to watch SNL but that night for some reason I was. Her voice was, and is, amazing. I was also completely taken with the fact that there was this beautiful, amazing singer who was singing her own stuff and who clearly hadn’t kowtowed to the music biz conventional wisdom that she had to drop a bunch of weight/use drugs/look like Amy Winehouse to be successful. We all know how that worked out. Adele’s first album was internationally successful. She’s now a household name. 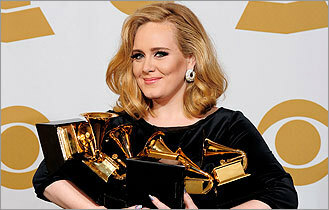 And, as of the other night, she’s won six, count them, SIX, Grammy awards. And yet for some reason there are still haters who insist that she’s fat and will publicly try and shame her about her size. I don't know about you but I think she's beautiful. The most recent is Karl Lagerfeld, no looker himself. I wonder how he feels now that Adele has won 6 Grammy awards and is the toast, of, well, everywhere. Yeah, he’s the designer for Chanel, but there are a whole lot more people buying Adele’s albums worldwide than there are buying his designs. Karl, you should go back to making your overpriced designs for Chanel and keep your mouth shut. Nobody is interested in what you have to say about music or the people who make it. 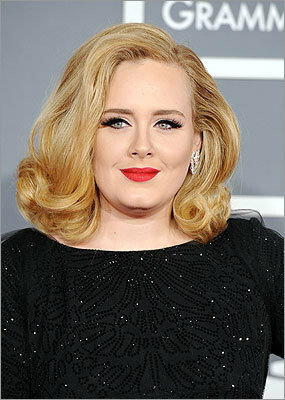 Adele, keep singing and being your fabulous self. You sound and look amazing and don’t let anybody tell you otherwise.